Talent agency: First Strong Workshop, Ltd.
Aaron Kwok Fu Shing is a famous singer and film actor in Hong Kong. 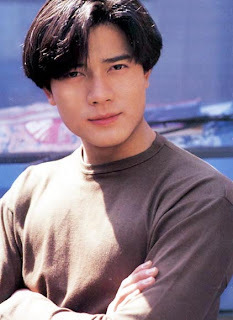 The Chinese media refer to him, Jacky Cheung, Andy Lau and Leon Lai as the Cantopop Four Heavenly Kings (四大天王 Cantonese: sêi daài tïn wong, Pinyin: sì dà tiān wáng). He is also known as "Hong Kong's Michael Jackson" because of his excellent dancing ability. In 2004, Aaron held a series of concerts which impressed fans and critics alike, and garnered him a Hong Kong Dance award presented by the Hong Kong Dance Alliance. Due to the overwhelming success of his 2004 concert series, Aaron held a second series of concert in the following year. He shaved his head for his 2005 concert, and his new image surprised a lot of the audiences. "The Aaron Kwok Mega Hits Live In Concert 2005 Chapter II" got great reviews from the audiences and the media, due to Aaron's amazing performance and fabulous clothing. At the Taiwan's 42nd Golden Horse Awards ceremony on November 13, 2005, Aaron won the Best Leading Actor title for his role in "Divergence" by beating out Hong Kong veteran Tony Leung Ka-Fai and took everyone, including himself, by surprise. This was also Aaron's first Golden Horse nomination. Aaron was a dancer before he started his music career. He started out as a background dancer for TVB music and variety shows. He first gained recognition in Taiwan for a TV advertisement. Soon after, in 1990, his debut album "Love You Endlessly"( 對你愛不完 Cantonese: dêui néi ngoî bät yun, Pinyin: duì ní aì bù wán) was released in Taiwan. This album had sold more than 500,000 records in both Taiwan and Hong Kong. The song "Love You Endlessly" (對你愛不完) was the biggest hit in the early 90s. The success of his first album made him famous in Hong Kong and earned him the title as one of the Four Heavenly Kings in the Chinese music industry. 51-year-old Aaron Kwok (郭富城) and 29-year-old Moka Fang (方媛) have finally tied the knot in a low-profile, yet lavish wedding ceremony held at The Peninsula Hong Kong on Tuesday, April 18. The couple only invited close family and friends to the ceremony, filling up 8 tables. Aaron’s groomsmen included fellow actor Chilam Cheung (張智霖), choreographer Sunny Wong, fashion retail giant Sham Kar-wai (沈嘉偉), designer Dorian Ho (何國鉦), Tam Kwok-ching (譚國政), and concert producer Jack. Security was tight at the wedding, and the newlyweds arrived at the location via helicopter. Reporters were prevented from filming the venue, but a quick glimpse inside showed that Aaron and Moka had went for a romantic rose wedding theme. The tables were decorated with red flowers, and utensils were gold-plated. Despite the tight security, some details of the wedding were leaked online. There was a live broadcast of Aaron and his groomsmen playing door games and welcoming the bride. The couple had their cake-cutting ceremony around 8 p.m. Both Aaron and Moka were in tears during their signing ceremony. The MC of the event shared that Aaron got drunk at his bachelor’s party the previous night. Aaron’s agency has released several photos from the wedding. The first featured Aaron with his groomsmen, and the second was a wedding portrait. Aaron had his arms around Moka, deliberately covering her belly. Aaron Kwok Moka Fang 4Several hazy photos from the wedding were leaked online, which showed Moka looking about 5 months pregnant. The couple hasn’t responded to these pregnancy rumors. Aaron’s manager Siu Mei (小美), Sunny Wong, and Tam Kwok-ching greeted the reporters on behalf of the newlyweds. Siu Mei approached Moka’s pregnancy rumor with caution, and stressed that she doesn’t know if the couple are expecting. And Aaron's father in law said to him that he grew up listening to Aaron's song! LOL. But I have to say that Aaron looks really good for 51 years old. Hong Kong superstar Aaron Kwok is father to a baby girl, Sin Chew Daily reported. It was learned that the 51-year-old actor accompanied his Shanghainese model wife at the hospital. Kwok is said to have arranged for his mother-in-law to come to Hong Kong last month to take care of Fang. Kwok, the last of Hong Kong's four "Heavenly Kings" to tie the knot, and Fang married in Hong Kong in April. And now he become father .